February 23, 2010 - Randy Tinseth, Vice President, marketing for Boeing Commercial Airplanes stated on “Randy's Journal” “The first 787 - ZA001 returned from Moses Lake Sunday morning after landing there on Friday. "Our flight test pilots had touched down at the Grant County International Airport after they experienced an uncommanded loss of thrust in one of the engines. It was an opportunity to really see the best of Boeing kick into gear. Teaming with Rolls-Royce, we determined that the issue had to do with a pressure-sensing component within the engine. “We located replacement parts and then got the parts and the right crew to Moses Lake - beginning the maintenance activity on Saturday. Later that day, we ran the engines to confirm that the replacement had been done correctly and that there were no anomalous readings. So, Sunday morning, we flew home. “The airplane is going through the maintenance and pre-flight work that would have been done had it arrived back at Boeing Field on Friday evening. I can tell you that ZA001 will soon return to flutter testing. It’s a great tribute to the team that they completed the analysis, maintenance activity and testing in such short order. This is what happens during flight testing - and our plan accommodates such events. We deal with issues and we keep going”. The fourth Boeing Dreamlifter – the final airplane in the fleet of specially modified 747-400s – entered service on the 16th. Dreamlifters transport the large composite structures of the 787 Dreamliner from partners around the world to Everett, Wash. for final assembly. The unique airplane, which was modified by Evergreen Aviation Technologies Corp. in Taipei, Taiwan, took off from Paine Field in Everett early this morning. Bound for Wichita, Kan., the Dreamlifter is returning the equipment used to transport the forward fuselage section known as section 41. The airplane's registry is N718BA. Boeing on the 3rd publicly unveiled the first 787 Dreamliner to feature interior components. The third flight test airplane, ZA003, has a partial interior that provides a glimpse into the new flying experience the airplane will offer. Configured for flight-testing purposes, the interior includes instrumentation racks, flight-test equipment and workstations for engineers. "This airplane is specifically configured to test the passenger experience elements of the airplane," said Tom Galantowicz, director of 787 Interiors, Commercial Airplanes. "Our engineers and flight-test team use a disciplined process to certify the various elements of the interior and conduct airplane-level verifications." The interior includes 135 seats, multiple lavatories and two crew rests. Certifying the interior components involves analyses and testing of the lighting, lavatories, stowage bins, dimmable windows and galleys. Passengers will be welcomed onto the 787 by sweeping arches, dynamic lighting, larger lavatories, more spacious luggage bins and electronic window shades whose transparency they can change during flight. "Our team is making great progress and is looking forward to getting this airplane in the air later this month," Galantowicz added. Flight testing will continue in the months ahead. Delivery of the first 787 to launch customer ANA (All Nippon Airways) of Japan is planned for the fourth quarter of this year. Boeing on the 2nd moved the 787 Dreamliner fatigue test airframe to its structural test rig. Test set up is expected to begin immediately, with tests commencing midyear. "Unlike static tests, where loads are applied to the airplane structure to simulate both normal operation and extreme flight conditions, fatigue testing is a much longer process that simulates up to three times the number of flight cycles an airplane is likely to experience during a lifetime of service," said Scott Fancher, 787 vice president and general manager, Commercial Airplanes. "This testing is instrumental in confirming the longevity of the airplane." 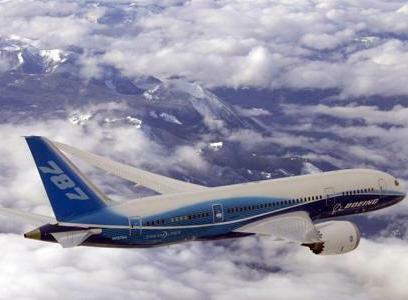 On January 15th Boeing completed initial airworthiness testing on the 787 Dreamliner. This milestone will enable more crew members to take part in flights and will allow more airplanes to join the flight test program. "This is an important step forward," said Scott Fancher, vice president and general manager of the 787 program, Boeing Commercial Airplanes. "We are very pleased with the results we have achieved so far. The airplane has been performing as we expected." Since the first flight in mid-December, the program has conducted several flights, achieving several key accomplishments. Pilots have taken the airplane to an altitude of 30,000 feet (9,144 m) and a speed of Mach 0.65. Nearly 60 hours of flying have been completed. Initial stall tests and other dynamic maneuvers have been run, as well as an extensive check-out of the airplane's systems. Six different pilots have been behind the controls of the 787. In the weeks ahead, the team will continue to expand the flight envelope at which the 787 will operate to reach an altitude of more than 40,000 feet (12,192 m) and a speed of Mach 0.85. Subsequent testing will push the airplane beyond expected operational conditions. "The pilots have told me the results we are seeing in flight match their expectations and the simulations we've run. That's a real tribute to Boeing's expertise and the international team that helped develop and build the airplane," said Fancher. Flight testing will continue in the months ahead. First delivery is planned for the fourth quarter of this year.